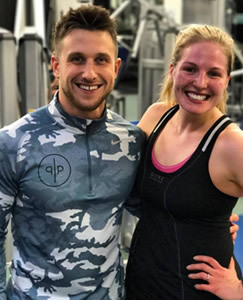 Our gym is home to some of Edinburgh’s best personal trainers, with a fantastic in-house team as well as some very talented independent trainers who have chosen to work from Energy Gym because of the great facility we offer. Each trainer offers something different and are independent because they are damn good at what they do. Specialities include sports performance, re-habilitation, pilates, bodybuilding, powerlifting, Olympic lifting and nutrition. All of them offer great training to improve all-round fitness. Our impressive in-house team includes Callum Watt our General Manager, Poppy Croal (Assistant Manager), Lisa Blum, Greg Cannie, Darren Clark, Sam Clarke and Rory & Callum McDevitt. This fantastic team are on hand to support any questions you may have and deliver Energy Gym inductions. We are lucky as they all have their own fitness specialisms including sports performance, bodybuilding and nutrition. All personal trainers offer a free initial consultation to discuss your requirements. See below to find out more and book a taster session. (although that will get you the best results) and can contact them directly. Callum is a fitness fanatic, mountaineer and chess sorcerer. He is best known for his healthy mind, healthy body philosophy. Callum began training in gyms over 20 years ago aged 14. He was inspired by his Dad Tom, who at the time was 2 time Scottish NABBA bodybuilding champion (over 40s). Callum has a diverse work background, with over 15 years of leadership, coaching and managerial experience in the corporate sector with major companies including Barclays, Standard Life, Capita and F&C Asset Management. He combines this wealth of experience with 6 years working in the Health and Fitness industry, as both a Personal Trainer and Group Fitness Instructor. Poppy has been involved in sports from a young age and kayaking has always been the main focus. She started when she was only 8 years old and first competed for Great Britain on her 18th birthday. Belief it or not, she started training at Energy Gym at just 13 so perhaps it was fate that she has subsequently become Assistant Manager. Poppy’s training ethic is second to none, spending a lot of time on training camps for kayaking/canoeing and working with young people at the Forth Canoe Club, teaching the next generation how to do this great sport. Indeed, Poppy’s dedication won her the 2013 Scottish Canoe Association’s young person’s Coach of the Year Award. Poppy is a beast when she trains, with an all-round functional fitness approach. She can be seen popping out pull ups and doing the splits most days but likes to mix it up doing all things gym from strength training to body weight exercises, stretching and cardio! Greg grew up in the Middle East before returning to the UK to study law at university, eventually settling in Edinburgh. Greg became a member of Energy Gym last year, having trained at the gym for a number of years beforehand. Greg’s main sporting focus lies in rugby, where he plays for our amazing in-house Rugby team Boroughmuir as well as competitive 7s sides such as the Co-Optimists on the GB7s series. Greg trains hard – tailoring training to both forms of the game by combining plyometric and speed based work for the faster paced shortened format of the sport with regular weight and resistance training for the more physical demands of 15-a-side rugby. More recently he has started to utilising Pilates and flexibility work as a means of injury prevention and enhancing career longevity. Greg is interested in sport-specific training and am keen to help out with anyone looking for ways to tailor their training programme to achieve the best results possible for their particular sport. Gordon Dillistone is a tennis professional and personal trainer. Described as a smiling assassin, he can happily converse with his clients in French, German, Spanish and Swedish having lived across Europe whilst studying languages and playing tennis. On returning to Scotland, he quickly found his calling in fitness and has never looked back since. 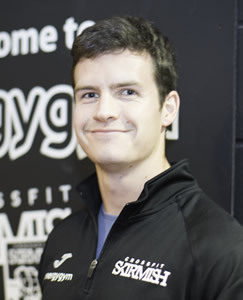 In addition to classes, Gordon works on a 121 basis with personal training clients. He is a specialist when it comes to training legs and core, utilising unique methods designed to achieve maximum results in a short space of time. 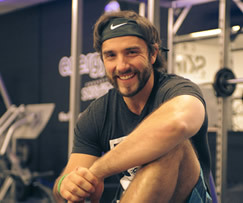 Paul Kennedy is a fully qualified REPS level 3 personal trainer and also has and advanced nutrition qualifications too. Paul has been involved in fitness ever since he was a nipper which made it easy for him to choose a career in the health and fitness industry. He is a sport specialist having played football professionally and also played other sports including rugby and boxing which means that he is ideally placed to offer sports specific training programmes. He is also a great trainer for generic fitness programmes as he uses his varied background to ensure that you never get bored by using a large contrast of physical training and motivational techniques. Mark is a specialist in Pilates, exercise to music and personal training. He is highly qualified with degrees in Sports Science and has an impressive array of fitness qualifications including kinesiology. With over 30 year’s experience behind him, you are in safe hands as his ‘know-how’ and experience is simply second-to-none. Mark works with people from all backgrounds and with a variety of training and theraputic requirements. This means he works with athletes on performance improvement and/or injury re-habilitation to post-pregnancy clients and of course to those who simply want to improve flexibility and fitness. Mark offers PT and pilates in 121 sessions and also runs Pilates classes in small groups which enables him to focus on each individual and help them receive the best workout possible! His Pilates classes work to a reasonable pace and unlike gentle Pilates methods, you will work hard to see and feel results, becoming familiar with equipment such as Pilates rings and stability balls. Pilates classes typically last around 1 hour long and must be booked in advance. Pilates courses are in 8-week blocks. Pilates will not only help you stabilise your core but it has other benefits such as co-ordination, strength and flexibility. Natalia Witt is an impressive personal trainer, having spent 4 years studying Fitness, Exercise and Wellbeing. She is now a REPS Level 4 personal trainer which means she has considerable knowledge of advanced personal training programming know-how and nutritional expertise. She has been working at Energy Gym for the last 2 years building her client base and transforming clients. Natalie ‘walks the walk’ when it comes to training and nutrition and is an impressive female physique competitor. Indeed it was after a successful debut season in female physique competitions, where she won the Muscle Xcess Show 2016, that she decided to focus on personal training as her full time job and share her knowledge to help others. Natalia specialises in weight loss, improving muscle tone and building muscle. Indeed Natalia is a body building and physique specialist who works with body building athletes who want to compete, supporting them with advanced programming and event preparation. In addition to building superior bodies, Natalia is also a post-natal training specialist so can help re-build any damage done and improve overall fitness, focusing on weight loss and body transformation. Natalia offers free 1 hr consultations to discuss your goals and agree a plan of action to help achieve them. 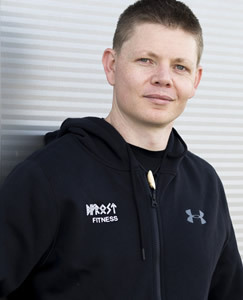 Joe Mills, Transform – MBT is a qualified personal trainer, deep tissue masseuse and functional cupping therapist. His interest in training came initially from bodybuilding with a few of the ‘old school’ taking him under their wing when he began training. This sparked his own desire to help people with their own training and lifestyle. He then moved on to pro wrestling participating in shows around Scotland, until he was forced to give it up through injury. These days, although his own training is strength based, he trains people to support multiple disciplines from fat loss and health improvement (focussing on small, sustainable lifestyle and habit changes) to sports based training for athletes involved in power lifting and rugby. 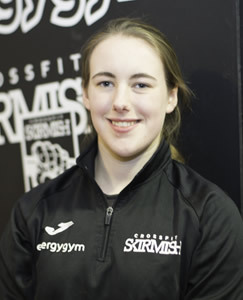 Rebecca (ThinkFit Training) is a fully qualified REPS Level 4 Personal Trainer and Kettlebell Instructor, and is also in her final year of a Sport, Fitness and Coaching (BSc) degree. She loves all aspects of fitness, and has a particular interest in strength training and free weights. She is absolutely passionate about finding the right program and approach to suit her clients and their needs. 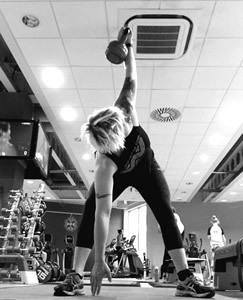 Rebecca has been involved in sport and exercise for well over a decade, and found her way into personal training through playing and coaching roller derby (a full contact sport on roller skates) and running sport-specific bootcamps. Having been all over the spectrum herself in terms of fitness, health and weight, Rebecca understands the struggle of creating a positive and effective relationship with exercise and nutrition. She offers block bookings with support between sessions, and is committed to helping you meet your goals. Facebook – www.facebook.com/thinkfittrainingedinburgh for more information and to book a free consultation. Matt Peacock used to be a structural engineer, however, after getting into health and fitness to transform his own body he decided to re-train as a Physical Performance coach, specialising in body transformation. 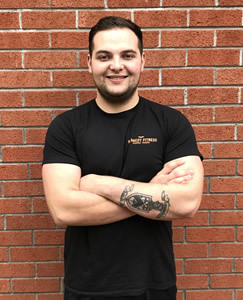 Matt has been honing his skills as a trainer for the last 2 years, adding to his knowledge with advanced Precision Nutrition qualifications to ensure that you get the full package – high impact training, fun, targeted programming to achieve your goals and nutrition plans that get results. 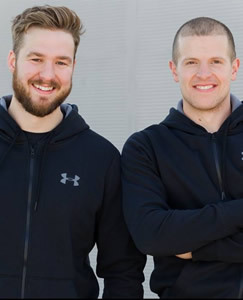 Re-Volution Fitness is a dynamic duo – Connor McCourt & Andrew Wilson. Both are top athletes who are committed to empowering people with movement, knowledge and training tools to be able to take on and overcome any goals they wish. They want you to stop feeling chained down or held back when thinking about taking on any challenge! Both of these personal trainers are highly motivational and will keep you on your toes with new and alternative training options. Indeed, Connor is an assault course specialist and Spartan sponsored athlete. This means he likes mud, running and endurance as well as mixing it up with strength training too. They both love the great outdoors so dependent on your goals you may find yourself in the great outdoors as well as Energy Gym. One thing for sure is that your training will be fun at all times! become a qualified personal trainer. 10 years on, he has worked as a PT in Zimbabwe, London and now Edinburgh. Shayne firmly believes in educating clients about training their bodies, but also about educating their minds. any fitness barriers you may have, motivate you and support you in your fitness journey. Shayne is committed to helping you achieve your fitness goals and will provide you with varying challenges, bespoke programming as well as information to improve your nutrition. Craig has the perfect balance of Fitness ‘know how’ and hands on knowledge. A graduate in Sports & Exercise Science (BSc), he started his career doing grass roots football coaching at local schools and community centres. He then took on a management role at Energy Gym, completing his personal trainer qualifications and building a reputation as a fantastic strength & conditioning coach. 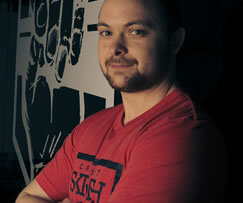 Craig discovered CrossFit in 2012 and was instantly impressed both by the ‘science’ behind the programme and results. His own training regime was transformed as was his own physique. 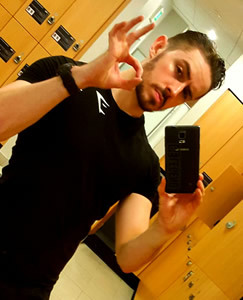 Craig is an impressive trainer – book a personal training session to see what we mean. Leo is an ex Army Combat Veteran of 10 years. Having left the forces, he decided to use his physical training and forces experience to re-train as a physical trainer and qualified Transformation coach. Leo uses his considerable experience to motivate his clients. He specialises in strength and conditioning, muscle gain, weight loss and postural correction. Leo also offers nutritional coaching to speed up your results and make valuable and practical changes to your lifestyle. James Ward began Body Development Training in 2016 to help people transform their bodies into something they can be proud of. James has a broad background in fitness ranging from long distance running, combat sports, strength training, body building and nutrition. 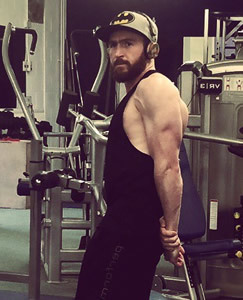 James specialises in body transformations and also assists in mindset development to aid clients in creating consistency and commitment in their pursuit of the body of their dreams through a method designed to create results in a set time period. 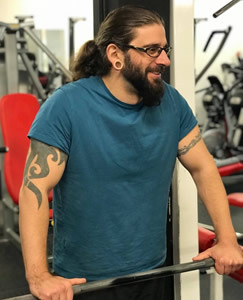 James not only provides great programming but focuses on education so that you get the confidence to workout independently – he will help you to achieve things you didn’t think possible. You will learn the importance of a strong nutritional foundation through the use of flexible dieting. James’ aim is to teach you how to create healthy eating habits that can not only fuel your workouts but allow you to enjoy a balanced lifestyle. After a rewarding, and often challenging 16+ year career in childcare, working with many different families, I decided that the time was right for a change of direction. For the past 8 years I’ve been focusing on my own fitness journey and along the way I have learned lots about my body and it’s extraordinary capabilities, but I’ve also had to deal with it’s weaknesses too. I have been fortunate to have trained alongside many PT’s and other professionals, who have helped and inspired me on my journey and I’ve really had my eyes opened about health and fitness. As a result, I decided to study for my Level 3 in Personal Training, and now qualified, I’m in a position to help others with their health and fitness journeys. Yes, I am in my 40’s, but age is no barrier to your fitness and I hope that with my life experiences and new qualifications, I can now help to inspire you on your fitness journey. We are all responsible for our health and fitness, but sometimes it can be daunting knowing where to start, especially with the latter. It will take effort, determination and a drive to change from you, but I am committed to helping you. So, do you have the drive in you? Are you ready to make your health and fitness a priority? I also run twice weekly bootcamps from Harrison Park, EH11 – so if you’re interested in some fitness outdoors in a fun, relaxed atmosphere then please get in touch! 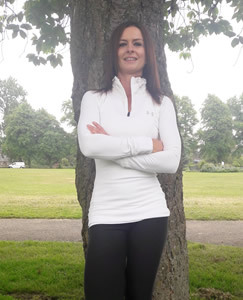 Lynne is a dedicated and passionate Level 3 Personal Trainer and Faster Trainer Expert. Having spent more than 20 years in the Civil Service ,in a wide range of roles, she decided to leave what had become an unfulfilling job ,take a career break, and follow her love of fitness. A decision she has never regretted one bit! Lynne is always energetic, welcoming and attentive with a healthy dose of fun and variety! Hi, I’m Victoria, BSc in Sports and Exercise Science and a physique competitor. Achieving and maintaining your ideal body is a lifestyle change. I have failed at it many times in the past, but I learnt from every fall. Fast-forward 8+ years and I have managed to take my body to a competition standard and I am proudly willing to share my experience, knowledge and mistakes with you. It is by no means a linear process neither it is an easy one. Besides exercise we’ll work on nutrition and a winning mindset. Sounds like a lot of work, but trust me, it’s extremely rewarding to find out how your brain works and what is your body capable of. I’m going to do my best to help you do it in a sustainable way, without denying yourself your favourite foods and social events. Find out how to wire your brain to work with you, not against you; create new, healthier habits to replace the old ones and enjoy your life as a more confident and healthier you. Personal Training keeps you focused on goals and ensures that you get the results you want.